I've got a little something for you. I'm sure I'm not the inventor of this cloth, but I've got my little recipe for you. SC in Ch next to hook, dc in next﻿, *(sc in next, dc in next) Repeat * to end of row. You should end on a dc. sc border all around entire square, with 3 scs in each corner. finish off, weave in ends! As always, you may sell items made from my patterns, but you may not under any circumstances sell my patterns or take credit for them as your own. 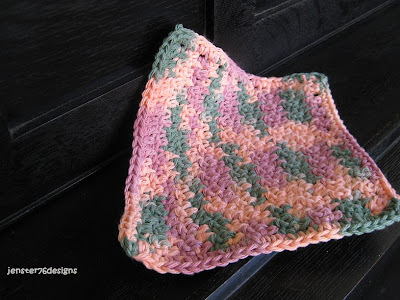 I love this pattern because it is easy, fast, and makes a dishcloth with substance. I've made two of these already. The first time, I found that when I started the sc in the chain after the hook, I didn't end up with a dc. I ripped out the first row and then started the sc in the second chain from the hook and it worked out perfectly. The second time, I just started it in the second chain, and again, it worked perfectly. I just wanted to post a little Hello! Your Profile made me smile! God Bless you and your family! Merry Christmas! I just wanted to drop by and tell you that I tried your pattern for the dishcloth and I LOVE it! SO easy to do...SO easy to remember and I really like the way it works, as opposed to the others I've been making. I made one up yesterday and have used it today...great feel in the hand and gets the dishes clean! Thanks so much for sharing. Thank you for posting this dish cloth. It looks really nice and I'm going to try making it today. I wanted a pattern with super scrubbing power. Thanks again!!! Just dropping by to tell you that this is one of my all time favorite patterns now! I'm selling these in the shop now and they always get great feedback. Miss talking to you and hope things are well with the job and family! I'm a momma with a little teensy bit of time on my hands... A big Hello to all my visitors. I would love to hear from you, so feel free to leave comments and follow my blog! Become a Jenster76 fan too!! New Blog... come on over!